She's so evil. I guess we shall see what she's up to this season. "For the night is dark and full of terror!" I didn't know the faces in the fire until I had another look - woah! But, my mum and sister showed me the odd clips involving her and suddenly turning old. I... I still don't know why, though? X.x; Still behind on GoT - maybe too far behind to understand things. Love all the different shades of reds~ <3 You drew such wonderful hair on her too. Nice piece! In flames and yet as dark as the original! 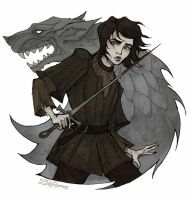 are you going to make drawings of arya stark as well? I like this take on her. Oh, she is part of GoT, okay. Who is Melisandre ? I mean is she part of a legend or is it a character you came up with ? She looks even scarier in your style! this is an excellent piece of work and a lovely take on her, but in my head she's at least partially oriental-looking and no one draws her that way the world of ASOIAF seems to follow earth's racial distribution roughly, and asshai is in the far east... wouldn't the people there probably be of asian appearance or something similar? carice van houten is an awesome melisandre but isn't quite how i picture her. Thanks, as much as I love messing around with colours, I really need practice. You drew her hair so interesting! I agree. This is a really interesting (and somewhat underdeveloped) GOT character. Oh this is so cool that I might start watching Game of Thrones! Should I read the books or watch the series? Gorgeous. I love your art style.